How and Why Deborah R. Dolen aka "Author" Mabel White Targeted My Family in a Calculated Nonsensical, and Overly Ambitious Pro se (DIY) Lawsuit Scam, and the Ugly Truth About Her Malicious Intent, Bullying Tactics, Bogus Claims and Vexatious Abuse of the Judicial System. Our courts are intended to be used by actual victims seeking justice, and not for scamming, greedy individuals who are willing to abuse the legal process set up by our courts by intentionally making malicious, meritless, and patently false claims in an attempt to reap financial gain through monetary demands of "settlement" in a game of lawsuit lottery. Jump to The Federal Court's Final Rulings and DISMISSAL of Dolen's nonsensical claims against us. Jump to The Federal Court's FINAL Judgment in FAVOR of the Defendants and AGAINST Deborah Dolen. There had been absolutely no provocation, no prior contact with or even knowledge of this woman who called herself "Deborah R. Dolen aka Mabel White" before she barged straight into our lives with her concocted and irrational claims in a vexatious pro se (DIY) lawsuit scam. After finding out that we'd been targeted in her lawsuit scam, however, it didn’t take long to realize that we were dealing with someone who was not only completely out of touch with reality and not in her right mind, but someone who was selfish, cruel, toxic, vulgar, calculating, unprincipled, unethical, and malicious, as well. (Not to mention that she was someone who was desperately seeking attention.) I don't know if she is at risk for delusions, or just evil, but it was more than a little concerning that this person had latched on to us with her hysterical claims and threats of a Federal lawsuit. With minimal research, we found that Deborah Dolen was a seasoned scammer and convicted felon - and she was now apparently intent on targeting my family in a new scam involving a pro se (representing herself) Federal lawsuit in order to set up (as she boastfully named it) her "retirement fund." Her problem: Even though she threatened and tried her best to smear our reputations in her calculated attempt to extort money from us through litigation for a bogus lawsuit, because we knew she could never back up any of her false claims or complaints, there would eventually come a time for her to "put up or shut up." We stood our ground and stood up to her, her threats, her bullying, and her attempted lawsuit scam, and we now hold a judgment against her for her "vexatious" behavior" (as defined by the Federal Court). Deborah R. Dolen made claims that she was a victim of cyber bullying. She also claimed she was a victim of "stalking" and that she had become a new advocate against it. She promoted many false nonsensical victimization claims, loss of income claims, claims of dental and health deterioration (allegedly due to us), and even her inability to fit in socially - but every calculated claim was a complete pretense and conjured up as a part of her plan to scam, scheme, and game the legal system (pro se) while disparaging, libeling, and labeling us as her "defendants," and her "tormentors." Why? Simply because we had become her latest scamming endeavor, in which she was trying to force us into to paying her to go away. Needing a platform for her rhetoric, being willing to consume the leniency of the court, and well-knowing that no actual attorney would ever involve themselves with this sort of frivolous and irresponsible behavior, on a borrowed dime Dolen simply marched into court and filed her nonsensical complaint as pro se. She then openly held it over our heads that she would ruin our reputations with her lies as she continued with her [pro se] lawsuit against us if we did not pay her to go away. In the end, Deborah Dolen obviously could not and did not (according to the Federal Judge) provide a scintilla of proof or evidence to substantiate ANY of her outrageous claims. The only evidence this lying scammer provided was that it was her own conduct that fell under the definition of being a stalker and a bully - and in reality, just like a textbook case of false victimization, everything she falsely claimed we were doing to her was exactly what she was doing to us. Here's the ugly truth about her attempted strong-arming game via a pro se lawsuit, her fictional claims, her delusions, her lies, and her motive. In late 2008, on a Topix forum where Deborah Dolen had been boasting and self proclaiming herself to be a "famous author," forum participants Googled her name and discovered her criminal history. They then ousted her on that forum as being a former prostitute and convicted felon. They posted links to newspaper articles written about her, and from there, things apparently got ugly because Dolen began denying her documented history. One of these posters, (Arden_1) had an IP location as being in the same [very large] city where my family and I live. At some point in time, Deborah Dolen and my husband's disturbed ex Angela Schubart Ledcke (now married to David A. Niehoff) (now married to Brian D. Bohrer of Carmel, Indiana had made contact and became friends. This was most likely because they had both been listed on a website that featured scammers. The revenge-seeking ex convinced lawsuit-eager Dolen that my mother, my husband, and I were the Topix posters, and she provided Dolen with our names and personal information. She baited and manipulated Dolen into doing her dirty work of *revenge by portraying to Deborah Dolen that we had lots of money. Prior to anyone in my family even knowing that Deborah Dolen existed, but after Dolen had briefly researched (stalked) us and our assets (as she has admitted doing), she and Ledcke devised a plan to have my husband and me named in a bogus lawsuit--simply to try and harass us and to force us into a monetary settlement. For an added act of malice, Angela Ledcke Niehoff Bohrer also provided Dolen with my elderly mother's name, and convinced her to include my elderly mother in the lawsuit. According to later statements made by Angela Schubart Ledcke Niehoff Bohrer (my husband's ex, and Dolen's partner in this endeavor), Dolen promised Ledcke that she would "get them" (us) for her. *The ex had lost custody of a 17 1/2 year old daughter to my husband a few years prior and was even denied any visitation (which clearly speaks for itself). She had been obsessed with trying to "get even" with us and constantly attempted to interject herself into our lives for the purpose of causing problems. This "lawsuit" endeavor must've seemed perfect for her ultimate revenge to try and tarnish our names as well as "punish" us financially. After all, neither of these women had anything (including their reputations) and they had nothing to lose. When convicted felon / paralegal / pro se plaintiff Deborah R. Dolen called my [then] 84 year-old mother on the phone in mid January of 2009, she introduced herself and began to explain to my mother how people were picking on her in some online forum and calling her ugly names. She went on to say how she was a famous author (Mabel White) and how she didn't deserve to be treat in that manner. My mother had no clue who this woman was or what she was talking about, so when Dolen began to ask my mother personal questions, my mother told her that she did not know who she was and that she was not interested. At this point Deborah Dolen began a verbal assault and rampage, and she threatened my 85 year old mother by telling her that she had "better be interested" because she was going to be "sued in Federal Court, lose everything she owned, and be thrown out in the streets." Soon thereafter, Deborah R. Dolen aka Mabel White did file her patently false and baseless lawsuit against my mother, my husband, and me, pro se in Federal Court. Her complaint and "Federal lawsuit" was nothing more than an narration deficient of any support, that was based solely on her own delusions. In fact, despite the fact that my mother had no internet access, computer, means or ability to access the internet, this bogus and fantasy lawsuit named my elderly mother as a "Jane Doe Cyberstalker" and accused her of cyberstalking, internet fraud, conspiracy, and even trademark infringement. For shock value and leverage for what would become a three-year continued attempt at extorting money from us, Deborah Dolen was also demanding a five year prison sentence for all of us - including my elderly mother! 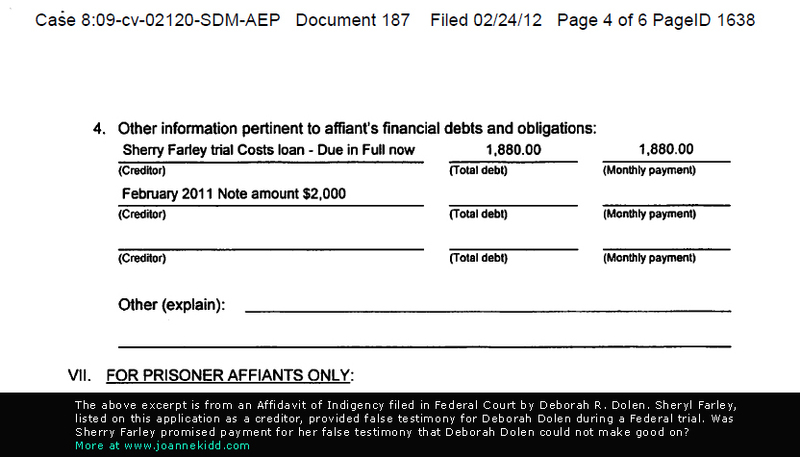 (Being pro se, Dolen obviously did not know that she couldn't make criminal claims against us.) In this game of lawsuit lottery, Dolen named all of us as "known cyberstalkers" and was demanding hundreds of thousands of dollars in damages - falsely identifying us as the posters on Topix and making all sort of bizarre and irrational claims against us. Her actions, her claims, and her theories - and even trying to identify us as these online posters were so ridiculously insane that they defied any boundaries of sanity! Any! Although none of us had never heard of Deborah Dolen or her "author" alias of Mabel White prior to being targeted and harassed, and although plaintiff / debtor, Deborah R. Dolen admitted that she has had no prior business or other dealings with any of us, obviously thinking she was being cunning, after filing a nonsensical pro se lawsuit against us where she was demanding close to a million dollars in damages, and prior to having us served, Dolen filed for bankruptcy (writing off close to a million dollars in unsecured bad debt) and listed each of us individually as creditors (for the amount of $1.00 each). Then, after she filed for bankruptcy, she served us with the Federal complaint. Why? Because, as she boasted, she thought she could sue us and we would be unable to file an answer or counter-sue her for her devious actions against us because she would be under the "protection" of the bankruptcy court "stay." If we (the defendants) didn't answer the lawsuit because of being named creditors, the plaintiff could potentially receive a default judgment. If we, the defendants, did answer the Federal complaint, her attempted intent was to slap sanctions on us in bankruptcy court for violating the bankruptcy "stay" of protection against creditors - even though were we NOT creditors at that time. Two courts - same game, and a lot of fraud. After filing her Federal lawsuit, her first demand for money was immediate, and she said that if we paid her $10,000 she would drop the lawsuit against us. We refused. At one point Dolen tried to bargain with us, and said she would not file for sanctions against us IF we were to pay her a few thousand dollars. (She actually made many demands of monetary "solutions" for dismissing us from her bogus lawsuit.) Her monetary demands ranged from $2,000 each to $10,000, and ended up escalating to claimed "damages" of a whopping $7,000,000. Deborah Dolen went on to make her claims against us public. She posted false and libelous commentary about us on websites, in forums, and self-published press releases. She named us individually as "known cyberstalkers" and claimed we wanted to obtain notoriety and some sort of "power" by associating ourselves with her. As a self-proclaimed maverick, she fabricated claims that we had "stalked" her, and that we had other victims, as well. She fabricated allegations and accusations that we had committed all sorts of internet fraud, trademark infringement, criminal acts against her - and more. At one point, she even published online a self-written fake court order against us so that the public would conclude that her stories were real. Every claim, every allegation, and in fact, the entire "Federal lawsuit" was a wild display of reckless irresponsibility, grandiose and persecutory delusions, intentional lies, and a vexatious attempt to libel and disparage us, whereby she could then demand money from us to stop. So, why did Deborah Dolen target us for her lawsuit? From what I learned about and read from this plaintiff since January of 2009, I think this came about because of some sort of grandiose/hero complex she may have. According to my husband's ex, Angela Schubart Ledcke, as mentioned previously, Dolen had contacted and befriended her because they were both featured on the same online scammer site. Ledcke dangled my family like a carrot in front of someone who was greedy enough to forget logic and reasoning, and set her sights on rolling the dice and playing a game of pro se lawsuit lottery. There was no other way on earth for Deborah Dolen to know who we were, know our names, our emails, and/or our personal information without the rants of her new friend and my husband’s longtime bothersome ex, Angela Schubart Ledcke Niehoff Bohrer. Although Ledcke eventually confessed to supplying this pro se plaintiff with our names, Dolen's original claim was that our attorney had “dimed us out” and that he supplied her with our names and information. The only little logistical problem with that was that Dolen and Ledcke were trashing us on an that Topix forum days prior to us knowing anything about Dolen and even before our we had contact him as our attorney. At that time he had never heard of us. Deborah Dolen's bullying wasn't exclusive to us. She threatened our attorney with a bar complaint if he did not do what she demanded! She took it to the next level and actually filed a delusion and fantasy-filled Texas Bar Complaint against him, stating under oath that he was the one who initiated her claims against us by prodding her to sue us. Her next step was to post her "testimony" and this bar complaint on the same website as the fake court order against us, and then trash-talk, lie about, and libel our attorney continuously in public forums - eventually to the point to where our attorney was forced to file his own Complaint Against Deborah Dolen for torts, injury, assault, libel, and slander. Although it has been defined as "stalking" by this deluded plaintiff, I discovered while trying to figure out just who this deranged-acting nut was who had targeted and was suing, harassing, threatening and disparaging my family, that Deborah R. Dolen (aka Deborah Ruth Harvey, Deborah R. Graves, Deborah R. Avramidis, Deborah Ruth Avamidis), has an extensive arrest, criminal, and felony record! According to her FDLE Report and court records in various Florida counties alone, this woman has been arrested for everything from prostitution procurement, solicitation of arson, pandering, forgery, credit card factoring, probation violation, Rico violations, money laundering, racketeering and grand theft, and much more. Deborah Dolen was one of several defendants in a consumer fraud action filed by the Federal Trade Commission, and the FTC named her as one of the Top 10 "Dot Con" scams ( more info). As Deborah Harvey, she was once even captured as a fugitive, tried and convicted of racketeering in a children’s Spina Bifida charity scam, and sentenced to a seven year prison term. It appears that while In prison, this pro se plaintiff obtained a paralegal certificate (via correspondence classes) and this may be where her illusions of being an actual attorney began. (I think this may also be where she learned and practiced the language she uses to attempt to intimidate others with her threats and legal-bully-talk, which I personally refer to as monkey-mouth-cell-gangster talk. This pro se litigant, as Deborah R. Harvey, had once been previously determined incompetent to represent herself pro se in Florida court during an appeals trial after being found guilty of felony charges. In one instance, I discovered that she had tried this bullying 'I’m going to sue you' tactic before by claiming she had the exclusive trademark for the term "soy wax." In that instance, she went so far as to pretend in a letter to be “legal counsel” (as D. R. Dolen) for Mabel White and another inexistent "partner" (aka alias) in order to threaten and intimidate candle makers. She claimed she would haul "violators" into Federal Court in Tampa if they used the term "soywax," but she offered to sell them permission to use the term. Now THAT, in my opinion, is just not normal! Anyway, being a convicted felon, no wonder she changed her name to Mabel White. Sounds pure and clean, doesn’t it? It seems that even "Mabel White" could not live up to honest standards, and although Dolen claims the name to be “good,” Mabel White Home Living has received numerous complaints over the years through the Better Business Bureau and has been the subject of several online scammer sites, reports, and consumer forums, and the defendant in at least one small claims lawsuit from Fed Ex. These complaints and concerns date back throughout the past half a dozen years, but Dolen has now claimed that even the complaints that are from 2002 through 2007 for Mabel White Home Living (MWHL) have come from me and my family--regardless of the basic fact that we would have had no motive, had no prior business dealings with her, and didn’t even know (or care) that she existed until January of 2009 when she began to harass us! Dolen, AS "Mabel White" has even posted rebuttals to many of these aged complaints against her business of Mabel White Home Living, and although they are years old she has publicly named and accused my husband, my 85-year-old mother (who doesn’t own or know how to use a computer), and me for submitting them. On the site RipOffReport.com, only moments after she emailed our attorney stating that whatever is posted on that site never comes down, as a rebuttal to a complaint from 2007, using her "trade name" of "Mabel White," Dolen posted all of our names along with her delusional accusations about us. Of course it’s just my opinion, but I would never do business with someone who demonstrates such unprofessional, unbalanced, and disturbing behavior. But then again, I have no interest in homemade lotions, potions, perfumes, candy or coffee flavor oils - and would never purchased from a business that was not licensed, reputable, and/or have FDA approval on their products. After all, these bathroom-chemist type businesses can too easily substitute canola oil as cheap fillers for essential oils, for example. No, it isn’t like me, but because my family and I have been inconvenienced for several years by having our names associated with this convicted felon, I am personally sick of Deborah Dolen's lies, threats, dogmatic delusional pro se legal attacks, constant attempts to libel and disparage us, and demands of money from us. In my opinion, this woman has obviously caused her own problems because of the poor and dishonest choices she has made and continues to make in life, and neither I nor any member of my family has had anything to do with her, her history, her problems, her scams, or anything else she may dream up, claim, and sue us for. As “famous” as she may think she is, she was (and is) inconsequential to us, as we had never even heard of her or her claimed trade name of “Mabel White” (an alias name she has used freely and directly to libel and harass us) prior to her unwarranted attack on us. What was a clear and undisputable fact in our world was that this plaintiff, prior to anyone in my family having any idea that she existed, was conspiring against us, researching our assets, posting libelous content about us online, and had already gathered our names, address, phone numbers, personal emails, work emails, and other personal information, and yet her claim is that we had been "stalking" her! Deborah Dolen has since continued to harass my family by publishing our names and address online, posting distasteful and delusional online comments and outbursts, complete lies, libel, libel per se, and has even published a self-authored fake and unsigned court order against us. Again, go figure. I am confident that plaintiff "Deborah R. Dolen aka author Mabel White" must've realized at some point that her fictional claims against us had no merit whatsoever and were solely based from the unsupported claims and gossip of her only source, her new buddy and my husband's ex, Angela Ledcke Niehoff [now] Bohrer (who has personally published online that she is a diagnosed schizophrenic). Whatever delusional entitlement this person may think she has to be able to pick someone out of thin air to sue, trash, and harass, and attempt to extort money from, she needs to face reality and realize that she made a poor decision when she attacked my family with her lawsuit lottery game. She has never known anything about us, and I daresay that if she had, she would be surprised to discover just who she choose to target. I am also convinced that pride, arrogance, mean-spirited gaming and greed outweighs her ability to recognize reality and ever admit that she was completely and totally wrong in the fantasy-filled conclusions, assumptions, and allegations she made against my family, and in naming us in her ridiculous nonsensical Federal lawsuit. Since writing about my experience in the above content on my blog, bogus lawsuit filer/pro se plaintiff Deborah R. Dolen aka author "Mabel White" motioned the Federal Court in the middle district of Florida for injunctive relief to shut down my entire blog, and she continued to demand money from us. Although that motion was filled with more lies, complete delusions, and whatever fantasies filled her head at the time of filing, the motion was denied. After the Court ordered her to amend her Federal complaint, she made a few more attempts at making demands from us, and even though we ignored her, she eventually dropped my family from her newest amended bogus Federal complaint. Aside from the fact that she often portrays herself as one of the "rich and famous," sadly, this person, as we have found through our personal experience, demonstrates a total lack of connection with reality, and in our opinion is nothing more than a bully, a nut, and a delusional wanna-be seeking attention. I am always shocked that there are people who simply do not recognize the consequences of their own actions. Dolen targeting my family in a vexatious lawsuit brought with it the consequence of me starting this blog. Because she brought my name online in order to try and trash and damage me in some way, I felt I had the right to defend my name from her delusional rants. In reality, my blog never would've existed, or at least she never would've been mentioned, because after all, without the actions she took in targeting us, I never would have known who she was! (She's not as "famous" in reality as she seems to be in her own mind.) It's just that simple, yet something this person does not seem to comprehend. Instead, she has continued to blame others for her own actions, and has thrown a fit in Federal court because I blogged about our experience of being the target of her latest scam attempt. In our world, we have never come across someone that could act so outrageously irrational and crazy, but I have to admit, Deborah Dolen, as "Mabel White, CEO" did email us (during the phase of her harassment campaign where she was emailing us threats via our employers) to warn us that she "can DO crazy!" Excerpt from one of her harassing emails to us. Even after being removed from Dolen's Federal complaint in June of 2010, in her attempt to further harass us, in early 2011 Dolen published several online "articles" that intentionally and falsely stated that we were still defendants in this case and "going to trial" as "cyberstalkers." She was also publicly gloating because of having associated our names with those damaging labels. With the exception of one [let's say] "less-than-credible" source, a website owned by June Maxam, NorthCountryGazette.org, all other site owners, after simply reading the irrational and ridiculous article(s), immediately, responsibly, and respectfully removed Dolen's bullying libel game from their online publications. Apparently June Maxam is known for the same sort of nonsensicality and for imagining herself to be a "news" correspondent of some sort. When asked to remove the articles she had published, Maxam, ignorantly referenced Dolen's obsolete complaint that the court had previously dismissed (removing us from as defendants from the case), and insisted that I did "go to trial" as a defendant! She simply responded that I was "wrong" in stating that I had not been a defendant at the trail. (Some "reporter" - huh?) (I've discovered that ethics, principles, and rationality all seem to run scarce in the world of felons and fruitcakes.) June Maxam, through her webhost, challenged me to sue, but suing the insolvent seems like a senseless waste of time. An Extra Helping of Insanity! I personally witnessed more insane conduct in this one bogus and vexatious lawsuit filed by pro se plaintiff Deborah R. Dolen than I think I've seen collective from anyone in my lifetime. Maybe that's because by choice, I've never had any association with this type of unscrupulous person before. Some of the tactics this plaintiff has used has been beyond what anyone with an ounce of honesty and/or credibility would attempt. Although she omitted my family from her 2nd amended complaint and threatened that if we continued with our counterclaims that she would motion to add us back in, she actually seemed to believe that she could simply invent claims against us and act as though we were still included in her bogus lawsuit. In some crazy attempt to try and intimidate me, Dolen listed my ex husband on her new witness list and stated that he would testify "against my character." When asked about this, my ex said he had never even heard of Deborah R. Dolen and that he had no intention of making any statement or testimony against me. Somehow, in her own little world, she must've theorized that because he was an "ex" that he would have something negative to say about me. Dolen actually included this rambling and delusional theory in one of her pleadings and even intimated that he'd left me in our marriage. As with all of her assumptions and claims, It doesn't seem to matter to her that she has absolutely no idea what she's talking about because she doesn't know anything about us. For the first day in over two years my family and I are no longer being sued and harassed in Federal court by pro se plaintiff Deborah R. Dolen aka "author" Mabel White in a targeted, nonsensical, and fictitious lawsuit lottery game. The Federal court ruled on the pleadings and ALL of Deborah Dolen's delusional and bogus claims against my family and me were DISMISSED with prejudice today in our favor and she is now barred from ever making those claims against us again. (Predictably, she somehow thought and immediately boasted in an email to our attorney that this decision was in her favor.) As the Federal Court order stated about claim-thrower Deborah R. Dolen's "tortuous action," "enough is enough." Order of Dismissal Our counterclaims were dismissed in that case, but were dismissed without prejudice, allowing us to reassert them in a separate action when and where we choose. There wouldn't be much use for this, however, because Dolen is what the courts commonly refer to as a "insolvent defendant." Simply put, she has nothing. April 21, 2011 - Julie Ryals Receives a Judgment AGAINST Deborah R. Dolen and ALL of Dolen's Claims Are DISMISSED WITH PREJUDICE! The Federal Judge in Tampa told Dolen that she [quote] did not show even the most minuscule ounce of proof to her claims. Dolen had said in published media interviews she had created by interviewing herself that she would not "fall into the sand trap" of having to provide proof of her unsupported allegations, but would instead bring in her own witnesses to simply testify "the old fashioned way." Because Dolen HAD no proof, but had been bulldozing through this case with only threats, bullying, and meritless and unsupported accusations, it was no surprise that this desperate plan was actually put into play. Dolen introduced the testimonies of Annette Bartowsheski (aka Annette Lahr), from Minnesota, and Sheryl Farley (aka Sherry Lynn Farley) of Bradenton, FL - two anonymous and scripted "witnesses" that Dolen brought in off the streets, who were willing to lie and perjure themselves in Federal Court for her cause. (I have to wonder if they realized while "testifying" under oath and the penalty of perjury, that the scripting they received from Dolen was overheard, and that Dolen had also confided in a "friend" who shared their plan.) In addition to the scripted "testimony" agenda, Annette Bartowsheski (Annette Lahr) seemed to think it worthy to point out to the Federal Judge that she didn't think it was fair that I hadn't published a negative (ugly) comment that she submitted to my blog. (Her comment, by the way, was the ONLY negative/ugly comment I have ever received, and it was one that fell into the "irrational nutcase" category.) Bartowsheski (Lahr) also, via her affidavit and testimony, stated and complained to the Federal Court that my blog was "too long." I suppose I was unaware that this was a Federal Court-worthy issue or offense, but like I said, "irrational nutcase." "Witness" Sherry Farley, clearly not in her right mind, was even less rational, and in addition to her testimony being completely off-the-wall crazy, she told the court that her deceased mother had spoken to her (by way of a tree falling on her house), and told her to "help Deborah Dolen." Despite these witnesses' and ridiculous testimonial scripts and transparent attempts to manufacture the necessary evidence by inventing it on the stand (aka perjury), the Federal Judge dismissed their foolery and disciplined Dolen, stating that she had an "infinitesimal-infinity chance of prevailing in this case." (Direct quote) When Dolen uttered a confused "a-wha?" the Federal Judge clarified by saying that Dolen had “a snowball’s chance in Hell of prevailing on ANY claims made against Mrs. Ryals.” (Another direct quote) He further instructed pro se plaintiff Deborah R. Dolen aka Mabel White that she is forbidden from ever bringing any claims she made or could have made against Julie Ryals in this case in the future in ANY court, therefore, dismissing ALL claims against Julie Ryals by Deborah Dolen WITH PREJUDICE! Pending was Julie Ryals' counterclaim of cybersquatting for the domain julieryals.com, which Dolen had originally purchased at the onset of this "lawsuit" endeavor to use as a tool for libeling, name-calling, and attempting to extort a cash settlement in the case. Dolen had kept this domain for 26 months, until eventually abandoning the domain and letting it expire - at which time julieryals.com was recovered by Julie Ryals. Because this ($12.00) counter claim was at this point moot, it was also dismissed. "IT IS ORDERED AND ADJUDGED that Judgment is entered AGAINST Deborah R. Dolen and FOR Julie Ryals on ALL Deborah R. Dolen’s claims." Despite Deborah Dolen's continued delusions of the outcome of her fictional lawsuit, the orders of the court speak for themselves. Order GRANTING Defendants' Motion for Fees AGAINST plaintiff Deborah R. Dolen, etc. Although it probably goes without saying, the simple fact that Deborah Dolen remained pro se throughout the history of this extortion attempt case is another indication of how baseless and unfounded her claims were and are. If her claims had held any merit or truth, contingency attorneys would’ve been lined up to jump on the case. Instead, they continued to warn her of her liability in pursuing – as did the various judges involved. I have to wonder if the plan to "get" us, coaxed by Dolen's abettor, Angela Schubart Ledcke, was worth it for her. She has built up such massive hatred toward us because we refused to be bullied, that I doubt if she has yet to realize how she was played by Ledcke and/or the [permanent] impact this entire endeavor has had and will have on her. I'd be willing to expect that she will never allow herself to digest the actual reality of her ruin or why we now hold a judgment lien against her. Image version of judgment lien against pro se plaintiff Deborah R. Dolen for her vexatious conduct. Topix poster Arden_1 was actually Suzanne Rossignol, a young woman from Lake City, Florida. I found this out early in the case in 2009 through a simple method of Googling her Topix screen name that included her email via her Topix profile, and then doing a search on Facebook using that email. This was something so simple, and something pro se plaintiff Dolen could have and should have easily done before suing me in Federal court because of her lamebrain assumption that I was this Topix poster. It’s called due diligence! This is one more reason why the attack on my family was calculated, and nothing short of an act of revenge instigated by my husband’s ex, and carried out by her greedy, scamming, convicted felon friend who had nothing to lose, and what she thought would be everything to gain. After discovering who Arden_1 actually was, I called Suzanne to suggest that she stop acting in such a reckless and irresponsible manner online, and told her that if I was able to find her real identity and contact information so easily, that anyone could. At first she was frightened by my call, but I told her that it was Dolen’s responsibility to discover who she was and assured her that I would not personally volunteer her identity during the case. Her response was something that I still find to be astounding. She told me that she comes from “a good family” and that her actions on Topix would affect that good family’s good standing if they were to find out how she had been behaving. (Apparently, my family was somehow perceived to be inferior, I suppose, so it was okay for me to take the blame for her words and behavior.) Although Dolen did eventually discover Arden_1’s true identity during the case, she was too far into it (and her extortion attempts) to admit it. Arden_1 being someone else wasn’t part of Dolen and Ledcke’s plan. Suzanne never came forward, and she let me take the full consequences and backlash for her actions. Thankfully, my family's good name was outstanding enough to bear up. If nothing else had convinced us that this Deborah Dolen woman was completely unhinged and a delusional nutcase, this did the trick! Being the author of her own narrative, she can pretend all she wants that she is "famous" and "important" and even that she is now "saved" and a "Christian." In real life, we've seen nothing but unprincipled evil from this woman in every way, and we've experienced the truth. In my opinion, a person of genuine faith would have humbled themselves without hesitation and admitted that their intent, abuse, and intentionally false actions against us were wrong, and a "saved" person would have, without question, made some effort to reconcile their wrong-doing and devil-spirited intentions against us. Instead, Deborah Dolen has continued to lie about her intent, claim we are "demons," ignore our judgment against her, bash our names, and has even gone on to various other interpersonal conflicts and suing others in her quest for monetary settlement(s). Disclaimer: This is my own personal blog where I have shared my own personal and direct experience with the individuals named. There has been no guessing or assumptions made as to who these individuals are. Any opinions expressed here are also my own, and are based solely and directly as a consequence of the adverse and personal experience(s) with these individuals. Florida Department of Law Enforcement Criminal Record for Deborah R. Dolen aka Deborah R. Harvey, 1984 to present. "Work at Home Company Closed" "The complaint was filed against AAA, two sister companies and business founder Deborah Dolen, who has admitted to being a prostitute..."